5000 World Walking Day (Shanghai) event participants gave their own answer to the question 'How the citizens who live in Mega polis, under considerable pressure, with fast daily rhythms, and are considered unhealthy, can gain a happy and healthy life?' on June 12th. They insisted that walking made the life healthier. 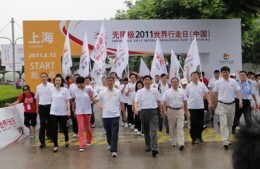 It is the second time that World Walking Day event was held in Shanghai. Participants from Shanghai Cancer Rehabilitation Center, Shanghai City Senior Citizens Association and other 5000 office workers enjoyed the 5 kilometers long walking in Pu Dong Century Park. Mr. Hei Jian, who walked in 70 countries around the world, was invited to attend the event and shared his feelings and understandings of walking. Other ten walking for happiness supporters and Mr. Hei experienced the walking with their motley hairpieces. Organizers aimed to achieve the objectives of "exercising every day, every people getting healthy " through the event. It is also the positive response to the "Sport for All Plan", and therefore encouraging more Shanghai citizens to attend the walking queue.